After many years of sailing, we decided on a change by way of touring NZ in a motorhome. We spent some time looking at motorhomes to ascertain what would bets suit our requirements. The Sinfonia 65 xt stood out for us, both in terms of value and quality. The deciding factor however was Shane – from the moment we first contacted Shane he was a delight to deal with. In the first instance, he came in specially on a Sunday to show us the Sinfonia. What struck us was his knowledge and passion for motorhomes, Shane took some time in explaining what we should be looking for in a motorhome. Once we made the decision to purchase the Sinfonia he went the extra mile to ensure it was ready for us prior to Christmas even though the time frame was very tight. In my typical bull at the gate manner I considered arranging for several extras for the Sinfonia to be fitted at the time of purchase, however Shane talked me out of doing that until we had used the motorhome for a period of time and we were certain that the extras were needed. That epitomises Shane’s integrity in my view. Shane has a huge infectious laugh (we enjoy cracking funnies just for the joy of hearing it) and nothing is ever too much trouble. The after sales service has been nothing short of exceptional, I often (particularly when we first got the Sinfonia) phone Shane for advice; given his years of experience and industry knowledge, I find his recommendations invaluable. We have grown to love our Sinfonia more and more as time has gone on and highly recommend Walkabout Motorhome Sales. I can’t reiterate enough how service orientated and knowledgeable Shane is. If you are looking at purchasing a motorhome, my advice would be to talk with Shane in the first instance – you won’t be disappointed. Living in Europe, I was a bit concerned about the idea of buying a NEW motorhome in New Zealand. I didn't know which model would suit our needs, which company would be reliable enough to buy one from, or if I could make the investment in a safe and clear transaction. I then compared every single company selling RV's in the country, and I'm happy I chose Walkabout! First of all, they really know their business. I got all the advice I needed, and could then make my decision : a Kyros Prestige Duo. This is, in my opinion, the perfect choice, in regard to our way of traveling! It is a very comfortable and well-equipped vehicle, that has led us safely on many roads & campsites in New Zealand. Last but not least, Shane, the owner, is a very honest, available and ... friendly person! He helped us in several occasions, even after we had purchased the motorhome! Shane thanks sincerely for meeting our wishes, to purchase this really amazing Motorhome. It was very recent that we found Walkabout Sales, and were taken with all the many features that we loved in this unit. Shane, you have been amazing to deal with, answering our many queries regarding things we didn’t quite take on board the day we took delivery of our dream home on wheels. Shane arranged for us to view one in Lyttleton, and as soon as we entered the home, we fell in love with this one. The people were amazing, so proud to show the many features, that sold it to them. What really caught our eyes, was the separate living, shower, and sleeping areas. This was a dominate feature for us. After searching four or five years for the right one , we knew immediately, the Magis 66 is it, and much more! It has that ‘Wow’ factor and for me especially, the house part is extremely well appointed, with a large Fridge/Freezer to house many meals we catch on the way. Shane, from the moment we spoke firstly on the phone, until we met you, your laughing voice told us you are extremely proud to sell these models. Pretty unbelievable was the Christmas parcel, and bottle of fine N.Z. Wine, and then two fabulous outdoor chairs, with small tables attached! O.M.G. we are blown away by the kindnesses and generosity of this company, ‘Walkabout Sales’ and won’t hesitate to highly recommend them to anyone showing an interest in the model. Oh, hubby just loves sitting in the driving seat, and looks like the cat who got the cream, as we drive around. He is suitably impressed with the Fiat Ducato motor, and all the features this vehicle has. Blue Tooth, aligned to our mobiles. I was amazed when a text message came through the radio, and as I accepted it, was read the message out! What vehicle has this technology? That was so funny, I had to hear that again. In all, this has been a wonderful experience Shane, and an absolute pleasure to deal with you, we look forward to so many holidays and exploring our beautiful country, and calling to say ‘Hello’ Shane, when next in Auckland! Thank-you Shane, and we wish you, your wife and family, a Blessed Christmas, and a wonderful 2016! We owned a campervan in Australia for a while and had been renting campervans for 4 years to explore around NZ and then decided to buy one as we had many more places to go and knew what we wanted in size, layout and features. We spent six months looking at every brand available in NZ, attending motorhome shows and talking to other owners before deciding on buying from Walkabout. Their campervans ticked all the boxes and Shane was such a pleasure to deal with that it was easy to take the plunge and buy the Magis 66P . We are very happy with our decision, it suits our needs perfectly. Shane answered all our questions (pre and post sale), he is a great ambassador for the CI campervans. Shane found time in his busy schedule to fit around our needs and always responded quickly to queries without ever leaving you feeling you have wasted his time. The Magis66p has a superb layout, a stylish interior and is competitively well-priced. Further, you know the price from day one. "Extras" in other dealers' eyes are included, a few minor requests were met at no charge and only significant, genuinely optional extras involved additional cost. This is the second new motorhome we have purchased. We have had dealings with all the main players in NZ. In our opinion, Shane is easily "head of the class", a delightful man who understands customers' needs and really wants to satisfy them. We couldn't imagine working with anyone better." Just writing to THANK YOU so much for making the purchase of our new motorhome a delight. We searched for over 6 months to find ‘The One’ , looking at both New and Used vehicles. It took some time to actually figure out what was important to US and then it was hard to stick to that as some had some of the features we were after but not others. So it was a big learning curve and we had to find patience as we did want to own our own as soon as possible, after finally making the decision to purchase one. We found that dealing with you Shane made the whole process a delight. It was fantastic to have our new motorhome delivered to us in Taupo on Valentine’s day (This one is going to be tough to top). We have owned her for a month now and already been away 3 times. You have shown us great after sales support and been extremely helpful at the end of the phone, when we have needed some advice. The Motorhome itself has worked out perfectly for us and we are looking forward to many trips away, relaxing times and fun social adventures. Thanks again for the wonderful service you provide and we would recommend dealing with WALKABOUT SALES to anyone interested in buying/renting or even after any advice. My wife and I decided to trade in our Motorhome, Shane drove down to Palmerston North, collected our old one and took it back to Auckland where he sold it on our behalf. It sold in around 8 weeks at which point we confirmed our order for a new one to be imported from Italy. Shane delivered the new one to our home in Palmerston North and has been extremely accessible since then and nothing has been too much trouble. I would have no hesitation in recommending Shane as a person of honesty, integrity and a pleasure to deal with.. I had been looking for a Motor-home for sometime to suit my needs. From the moment I met Shane from Walkabout and he had shown me through the new 2015 Sinfonia I knew I would be purchasing one. Even though Shane was extremely busy on the day I visited , he took the time to explain every detail and gave me plenty of information, I was able to go home and think things over which was great. When Shane and Noleen delivered My new CI , Shane spent a couple of hours here going through everything we needed to know. Shane said he was a 100% behind the sale and was only ever a phone call away if I needed to talk to him. I have been away in my new Motor-home and love it, it is everything Shane had said it would be. We had been seriously looking for a motorhome for the last 6 months. Having owned a variety of motorhomes over the last 12 years we knew what we were looking for, we had a budget; all we had to do was find the right vehicle! We looked under every possible avenue, went and inspected a few that looked promising, but they did not measure up for a variety of reasons. We had been in contact with Walkabout Sales but thought they would be out of our budget range. 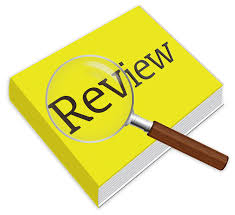 We sent our daughter along to view their motorhomes and she came back with glowing reports about how helpful Walkabout were and she thought that one in particular would come extremely close to what we were looking for. So we made a call to Walkabout enquiring about Ci Motorhomes, then a trip to Auckland (cheap air seats!) and Shane met us at the airport with the vehicle. We were able to drive it back to their depot. Lovely vehicle to drive. After discussion Shane agreed to add some good extras and offered free delivery that made the difference. A flight home and a week later the vehicle was delivered to our door (just north of Wellington). Shane again went over the features and made sure we were happy with everything. Just before he left he re-stated that he was behind the sale 100% and for anything we only had to contact him. We would whole heartedly recommend Shane and Noeleen at Walkabout Sales for helpful unpressurised deals. We are very happy having spent our first weekend away in our Brand New Ci motorhome. We have just purchased a CI Prestige Campervan from Shane at Walkabout Sales. Our previous motor-home was a Fuso 6 Berth also from Shane.After down-sizing our property and looking at smaller vans we didn't hesitate in making contact again. The Prestige is so compact but has ample storage and the swivel seats perfect for relaxing in. The extra wide single berths, dining area with added bonus of another smaller berth for grandchildren. Totally impressed with clever ideas to utilize space in the toilet/shower area as well. The total layout and decor has already been admired by everyone who has viewed....we look forward to more travelling in our new van. Once again thanks Shane for your ongoing excellent service and delivering van to Whangarei for us. We purchased our Motorhome from Shane a couple of months ago. We are absolutely thrilled with it. Shane was fantastic to deal with during the purchase and still continues to help us out. We highly recommend you visit Shane if you are thinking of buying a motorhome because he really knows his stuff. Just would like to say a big thankyou for the excellent service and extremely personal service we received from you on the recent purchase of our CI Motorhome from Walkabout Sales. Cannot speak highly enough of you. We would thoroughly recommend that anyone looking for a new motorhome to look no further than Walkabout. Great service, attention to detail and great communication. We had the pleasure of using our motorhome for the first time just three days after receiving it and had a great experience and just can't wait to use it again this weekend. These motorhomes are absolute luxury. Well Done. I couldn t have brought my motorhome from more obliging, genuine, and continuously so, people. anything I felt needed a little titivating. and excellent work was completed. The vehicle has more than proved how work efficient and comfortable it is especially on the interesting and challenging roads in New Zealand. covering 2 years, most are seeminly 1 year so that was very beneficial. Many Thanks for your help and going the extra mile with no worries. More than that continuing to do so. After looking at many motorhomes / campervans we visited Shane at Walkabout to view their selection of homes, we were very impressed with the open plan of the 6 berth and the very high quality of the finish inside and out. We had looked at Fiat, Mercedes and Ford but we were sold on the Mitsubishi Fuso based on our own reviewing and feedback from people in the transport industry. Whilst we blew out our budget and bought the low km 2008 Fuso 6 berth we are very pleased with the investment and are very proud owners, you would not know that this motorhome has been a rental. The whole vehicle is in immaculate condition. During the pre purchase period Shane replaced the front tyres without question and followed up with a new DVD player which was on order at the time of purchase. Shane was very pleasant and professional with the entire purchasing process and follow-up , I would have no hesitation in recommending Walkabout Sales. We have no regrets whatsoever about buying our motorhome from Walkabout Sales and Rentals. They have proven themselves by always being friendly, ready to help us promptly with any situation that may occur, providing us with helpful advice and hints etc and taking an interest in us and our travels. They are genuinely honest, decent people to deal with and we highly recommend them. We love our motorhome. Now that our fine weather has returned, I have been able to go over the camper more thoroughly, after purchasing it at the beginning of July 08, And we have been very impressed with the overall standard, especially under the couches etc, where obviously Walkabout Sales took the time to impart into the vehicle a standard of workmanship that is rarely seen these days. Again, thanks very much for your personal touch Shane , and for the chopping board, which Lyn thinks she will frame, rather than use it. I have hired a motorhome of you 4 times now as i come to new Zealand to see your fabulous country , Thank you for helping me every time , your vehicles are so clean and and every time i have a vehicle under 3 years old , I know i am a customer and not a number , that is why i come back to see you everytime . There are a number of people i speak to in camper parks not happy with their camper , i am returning again next year to your fabulous country , keep up the good work Walkabout I see you soon . We have just purchased a 6 berth motorhome 9/11/08 from Walkabout. Having previously owned both caravans and motorhomes were impressed with the roomy layout and amazing storage.. especially the outside lockers. Shane is informative,helpful and a super friendly guy to deal with. Our van was delivered to Whangarei and the after sales service continues. We would throughly recommend anyone wishing to buy a motor-home contact Walkabout first. Martin and I would like to say a big thankyou to you for all your help and support through our journey of buying a motorhome on 15/11/08 .Your service was outstanding and always done with a smile or shared laughter even when I asked some ridiculous questions. Your continued support during the purchase process and organising of our solar panel and awning along with the installation was greatly appreciated. This Latest & Greatest Fabulous New model Motorhome is built on the most popular based Fiat Ducato, where in Europe 85% of sales are Fiat Ducato. 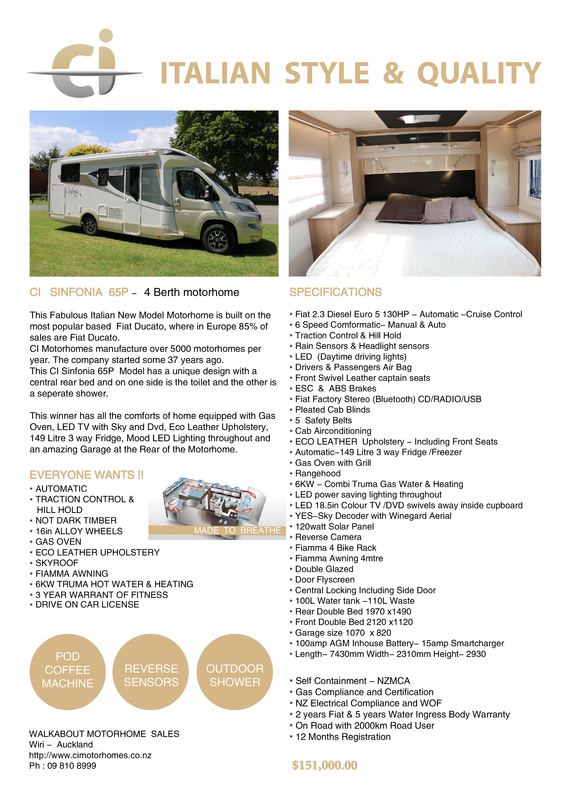 This winner has all the comforts of home equipped with Gas oven, LED Tv with sky and dvd, Eco Leather upholstery , 140 Litre 3 way fridge ,Mood LED Lighting throughout , and an amazing Garage at the rear of the motorhome .